During an official visit to Istanbul, King of Belgium Nicholas III is informed that Wallonia, in southern Belgium, has declared a state of independence. The sovereign decides to immediately return to the country. Unfortunately, his trip is delayed when a solar storm forces the closure of airspace and all means of communication are cut off. 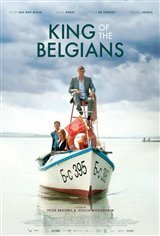 Nicholas decides to return home by car, along with a documentary filmmaker and a troupe of folk singers on tour in the Balkans. This journey gives him an opportunity to discover a world he didn’t know.